If you have questions about being a caregiver or about Alzheimer’s Disease/Dementia this should be your first stop. You will fall in love with Bob and his wonderful mother Dotty who passed away on May 25, 2012. Bob was the 24/7 caregiver to his mother for many years. He took what he has learned and decided to share it with the world. There are over 4600 articles dealing with these subjects on his website. He holds nothing back and ANY question you may have can be answered here. The first article I read was “Communicating In Alzheimer’s World”. Bob’s explanation of communication DO’S or DON’TS with someone who has AD is just what I needed to hear. It opened my eyes to all of the many mistakes I was making while taking care of my mom. DID YOU HAVE ANY EXPERIENCE WITH ALZHEIMER’S OR DEMENTIA BEFORE BECOMING YOUR MOTHER’S CAREGIVER? I didn’t have any experience with Alzheimer’s and Dementia before my mother was diagnosed with probable Alzheimer’s. You could put everything I did know in a thimble. 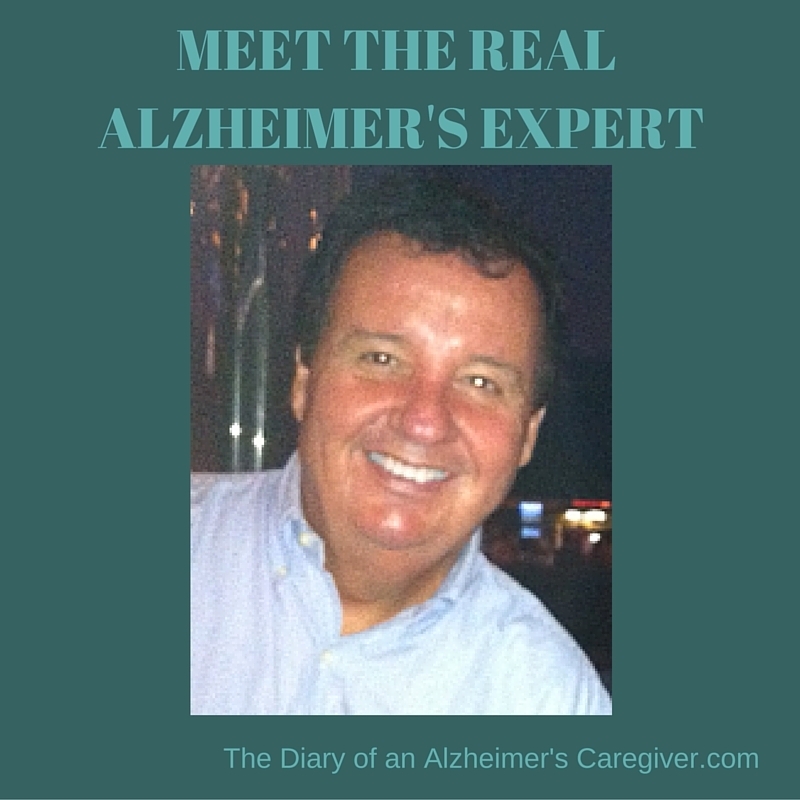 I will admit that I had bought into many of the stigma’s attached to Alzheimer’s disease. I did learn all of them are untrue. WHAT MADE YOU DECIDE TO START SHARING YOUR EXPERIENCES? I never intended to become a blogger or a speaker. It all started when our doctor told a neurologist at a major university that he had met “some guy who was taking care of his mother” he went on to say “I don’t know what he is doing but it is working”. That neurologist called me and asked me to start writing about my experiences. He promised to get me readers (and he did). After several months a retired editor from a major newspaper called me and asked me for help with his mother. Subsequently he said, “you are not writing about what you are telling me and you should”. I decided to take his advice. Shortly thereafter, readers and subscribers started flocking into the Alzheimer’s Reading Room. I was surprised, encouraged and then hooked. More than 5 million people have visited the ARR worldwide. IS THERE ANYTHING YOU WISH YOU HADN’T SHARED? I did have some reluctance at first. But after the advice from the editor I let it all hang out. I am an Alzheimer’s Caregiver myself, so I understand how caregivers might be thinking and feeling. Some of the things I wrote about our experience are pretty graphic. Some of the articles were pretty funny. Most importantly, I knew that my mother would have wanted me to do it. So there was no reluctance on my part to write about our life and experiences. WHAT DO YOU FEEL WAS YOUR GREATEST SUCCESS AS A CAREGIVER? I think about this question all the time. The answer is very long. If I had to say one thing it would be that I completed my mission in a way I could never have imagined. My mother died and went to heaven peacefully and in her own bedroom. The goal from the beginning was to keep her at home. She did not want to end up in a “home” as she called it. That was my number one goal from the very beginning, and the fact that we made it is the greatest accomplishment of my life. WHAT ARE THE TOP 5 THINGS EVERY CAREGIVER SHOULD KNOW? Alzheimer’s caregivers tend to “vent” and “complain” about things that are common to dementia patients. I know this because I did it myself. Repeating themselves, forgetting to take a shower or go to the bathroom, refusing to cooperate, these are all common problems that come with the territory. The list of problems is never ending as the disease stages. Amazingly, the solutions to these problems are usually very simple. You have to accept that the disease causes changes in the brain that results in changes in behaviors. I will freely admit that I finally realized that Dotty and I were living in a cave after about 18 months. Or that is what it seemed like. So I made a decision, we would start living our life the way we always had. I tried to remember what Dotty did before Alzheimer’s, and what she liked to do. I started to build a daily routine around what I knew. We started as soon as she woke up in the morning, and we were still going when she went to bed. Third, the importance of discussion and social interaction is imperative. I discussed the newspaper with Dotty as soon as she would wake up in the morning. I encouraged her to read the paper to me. I put the crossword puzzle in front of her (she had been doing them all of her life). Over time we added exercise, bright light, music, trips to the ice cream store and all of the other daily activities that Dotty enjoyed. Yes, over time we had to “dumb” these down a bit, but it was not hard to do. Four, just let them do. There is a tendency to start doing everything for the person living with dementia. THIS IS A MAJOR MISTAKE. I know this because I did it. It made my mother dull and uncooperative. She seemed to be falling into a dark hole. Once we started living our life something happened that I could never have imagined. Dotty was “more there”. The more she did, the better she looked and the more cooperative she became. I learned over and over that Dotty was more capable than anyone could imagine; and that, included me. I realize that we the caregivers are restrained by our “own brains”. We are the problem. My mother never stopped amazing me. She just keep doing more than I could imagine over and over and over. Five, they love you more. One of the most grueling parts of caring for a person living with dementia is that they sometimes quit saying “I love you”. They rarely thank you for all you are doing, this hurts. On the other hand, they can’ t stand to be without you. They follow you around. When they can’ t see you they will call out your name. If you go away even for a little while, they get upset. IF YOU ARE A CAREGIVER, PATIENT, FAMILY MEMBER OR JUST HAPPEN TO KNOW SOMEONE SUFFERING FROM ALZHEIMER’S OR DEMENTIA YOU CAN LEARN SO MUCH BY VISITING ARR. STOP BY AND CHECK IT OUT! I want to say thank you to Bob DeMarco for his continued support and education of Alzheimer’s Disease and caregiving. I also want to thank him for always answering my questions no matter how dumb they might be, listening when I needed someone to hear me most and for publishing the first articles I ever wrote on the ARR. Here is a link to those stories that I have had published on ARR: Memories-Her Mother Remembered 1957, But Not Right Now and also 10 Attributes of an Effective Caregiver. Your post reminds me of just how lucky we are to live in this day of the interwebs connecting us to people we may well have not been able to find in the past. The access, conversations, support is priceless. You are so right Karen! When I first became mom’s caregiver and didn’t really use the computer much. You could say I was in the dark about alot of things. Finding Mr. DeMarco’s site saved my sanity and maybe mom’s life. I have learned so many things. “They love you more.” It made me cry. He is an amazing teacher! I have learned so much although I still have a LONG way to go! I am so sorry that it is such a painful subject for you! I adore how you pulled the five things every care giver should know out of his knowledge base of 4600 articles. That’s distillation! The one that surprised me is #4, just let them do. It is surprising but after watching my mother as long as she’s not doing harm I let her do what she wants. Yesterday she had a fit because my husband was pulling weeds, she thinks they are her flowers so he just got the water hose out and let her water her flowers. We will probably have the biggest weed bed in SC but who cares she is happy! a very close person to us, has started to show signs of dementia.. I have noticed some of the signs you put in this post she is actually doing. Its unfortunate but she will be taken care of as it progresses. It is the hardest, saddest, maddening, loving, caring, emotional job that you will ever do. But realizing early and getting the right doctor and medication can slow the progress so much. My mother takes Namenda and has for 2 years. She quit taking for a week because we thought it was no longer helping. After 4 days I went and refilled it. I couldn’t believe the difference. These are all great tips for someone needing more information on alzheimers. Thank you Samantha but the kudos go to Mr. DeMarco if I hadn’t learned it from him first then I would still be lost in a very dark world. What great information. I wish I had it years ago when we started caring for my mother in law. Thank you for sharing it! Thanks Lana! It is always a work in progress. Believe it or not these are the easy days for us. I know it will get much worse before it is over. I love the five tips. It takes a bit to recognize the disease and a bit to adjust your reactions in a tough situation. That is so true Haralee things change around here on a daily basis! I have to share with my mom who cares for my grandmother. There are over 4600 articles on the ALZHEIMER’S READING ROOM they have been life-changing for me that’s for sure! There are also alot in my old posts! I hope it helps your mom! There is so much people should know about this disease before trying to care for someone or even just being a family member. Thanks for sharing this it will help many. That would be nice in a perfect world but real life and circumstances count for a lot in this situation. Thankfully there are sites like ARR and your local chapters of the Alzheimer’s Assoc. are great for local advice and help. Thanks for this important list. Being a caregiver of an alzheimers patient who is a relative is the hardest gift one could give. May peace find you and your mother. My sister is right now my dads caregiver it’s a hard work, thanks for the tips alzheimers is hard for those sick my dad knows it’s happening to him and it makes him sad. I will keep you and your family in my prayers. I hope you find the help you need. My mom has those moments of sadness also then an hour later she will deny having a problem at all. Amazing article. Until someone goes through it, you cannot really understand. Thank you for sharing! That is so true Don. All caregivers need support and someone to listen to once in awhile. I imagine that reading from people who’ve been or are going through what you’re experiencing is a real blessing! You are so right Liz. If I hadn’t found the ARR I don’t where We would be. What a great article. My aunt developed alzheimer’s a few years before she passed. It was really hard to watch and hard on the family. Thanks Hilary! It is so hard to watch a love one fade away thar’s for sure. In our house we try not to dwell on the sadness. There are so many memories left to make. thank you for sharing your thoughts and journey. while i am not caregiving to this extent yet, i am close and it’s comforting to hear from others. Thank you Janelle. Being a caregiver is the hardest job I have ever tackled but also the most rewarding in so many ways. So touching and so informative thanks for sharing. Honestly I look up to caregivers because they cannot act just like they are working for you but there’s a genuine heart put into the job. They treat you like family. In my case it is all about “family” but there are some really wonderful professional caregivers out there. Sometimes it must feel like having an extra large size toddler, having to balance what they want to do, what is safe for them and what is convenient for the caregiver. Having a bit of a break is crucial too. I tease her quite often Paula and tell her she is turning back into a teenager. Alzheimer’s reminds of an age regression alot of the times. Oh this is going to help so many people get the answers they need. I’m glad you found this site! It looks like it has been beneficial. Thanks Heather, if it hadn’t been for the ARR I don’t know what would have happened to us! It’s so hard to see someone slip through your fingers like this. Like you’re loosing them slowly. Sometimes it is very difficult to watch Chasity! I sure that happens sometimes LaTonya. I admire caregiver, because my loving mother is a caregiver, and reading this made me tear on my eye, especially that “They love you more”. Thanks for sharing, i had fun reading. Yes that is a very emotional sentence it, I also shed a few tears over it still. I couldn’t agree more Miriam! Thank you for sharing this! My grandfather was recently diagnosed with Alzheimers and it’s been a struggle to adjust to things for everyone in the family. It is a big adjustment Lisa and something that continues to change on an almost daily basis. Finding support early can mean all the difference in the world. Great tips! Thanks for sharing your wisdom! I agree with the acceptance and love you more. These are the things that one must learn to do so that life will continue. Very inspiring stories and you are so lucky to have a chance to meet and have a tea or coffee with this person. What a nasty disease! I had a aunt who suffered from it. Thank the lord for the people who take care of them.